Citrus. Crunch. Coconut. Pecans. Cream. These are some of my favorite flavors combined into one dessert. For the crunch part of this dessert, I baked a meringue mixture filled with toasted coconut and toasted, ground pecans and baked it like a pavlova. I’m lucky I had enough meringue to bake since I kept sneaking some taste tests. I’d made this coconut meringue another time, but this time added pecans for extra crunch and nuttiness. For the citrus part of this dessert, I made some lemon curd and folded it into flavored whipping cream. One of my favorite desserts is lemon meringue pie, and instead of the meringue on top, it’s on the bottom in this one. This is for Sugar High Friday #43 (started by Jennifer of The Domestic Goddess), which is being hosted by Helen of Tartlette this month. Position a rack in the center of the oven and preheat it to 350°F. Spread 1 cup coconut on large baking sheet. Spread hazelnuts on another baking sheet. Toast until golden, stirring twice, about 15 minutes. Cool. Maintain oven temperature. Ground the hazelnuts in a blender or food processor. Line another large baking sheet with foil. Whisk egg whites, cornstarch, vinegar, vanilla, and salt in large bowl until foamy. Gradually add sugar and beat until stiff peaks form. Beat in boiling water slowly (so the eggs don’t curdle), beating until whites are stiff and glossy. Fold in toasted coconut and hazelnuts. 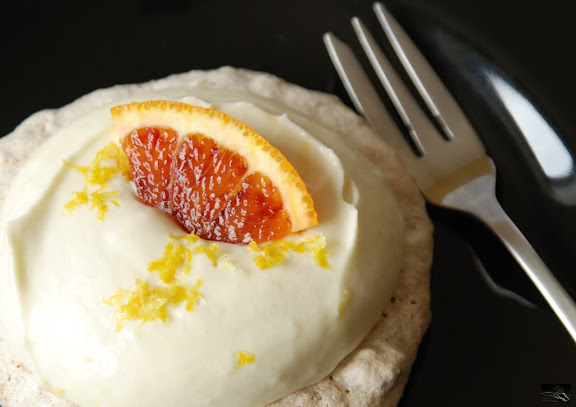 Spoon meringue onto center of prepared baking sheet and spread to 9-inch-diameter circle (or several smaller ones) with slightly raised edges. Sprinkle with ½ cup untoasted coconut. Bake meringue 10 minutes. Reduce oven temperature to 200°F and bake until dry and crisp outside and just cooked through inside, about 1 hour. Turn off oven. Let meringue stand in oven 1 hour. Remove from oven and cool completely. In a bowl, whisk eggs and egg yolks. Melt butter on the top of a double boiler. Whisk in sugar, lemon juice, lemon zest, and salt. Slowly whisk in egg mixture. Whisk until thick and thermometer inserted into mixture registers 178°F to 180°F, about 8 minutes. Transfer to small bowl. Press plastic wrap on top and chill 4 hours. You can make this 2 days ahead and keep it chilled. In a chilled bowl, whip the cream with the icing sugar and vanilla. Fold the chilled lemon mixture into the whipping cream. Place the meringue on the bottom. 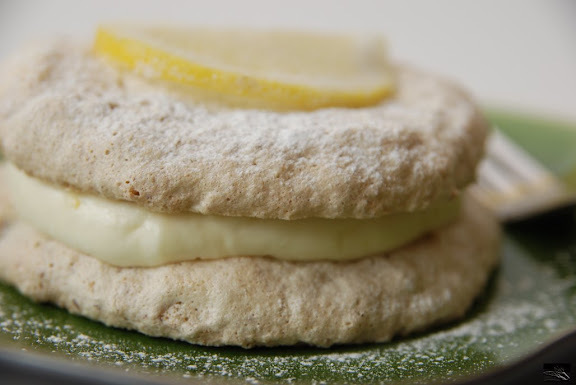 Top with lemon cream. Optionally, place another meringue on top. Dust with icing sugar. Have a citrus-y sugar high on me! See Pecan Coconut Pavlova with Lemon Cream on Key Ingredient. That lemon cream sounds delicious, I'll have to give it a try. Beautiful pictures too. So, so pretty! What a yummy and beautiful dessert you have there! i'm not a meringue fan but this concoction looks fantastic! i like the sound of lemon cream! and coconut and pecan are such a pair too. nice! I love these flavors and textures! I can only imagine the contrast of soft and crunchy...yum! Thank you for your entry!